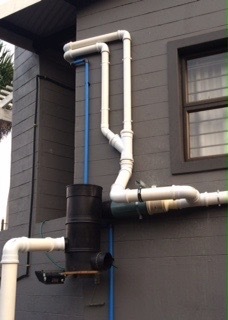 Our company designed and installed a rainwater harvesting system for a client in Salt-rock Ballito. Because of the severe drought and water restrictions our client decided to install a potable rainwater harvesting system to save water and reduce their consumption of municipal water. The Clients house was not designed with rainwater harvesting in mind and the biggest challenge was linking up the gutters to the Wisy® WFF 150 vortex primary filter. In order to harvest off the largest section of the clients roof, whilst preserving the aesthetics of the front road facing section of the house, the fall of the gutter was changed, and 75mm piping was tied into the side of the gutter. Flow calculations were done on the line to ensure that the line will be able to handle the largest downfalls. The result of the effort is that the client will now harvest off a total of 224 sqm of roof instead of 131 sqm, resulting in an extra 92 000 liters of harvested water per year. The clients system incorporates a first flush system to further minimize contamination of his stored water, a calming inflow to minimize disturbance to the bio-layer at the bottom of the tanks and a floating suction to ensure that the older cleaner water at the top of the tanks is used first. A float valve was used in order to balance his storage tanks which are situated at different heights, whilst not losing storage capacity of the higher placed tanks. A multistage centrifugal pump supplies potable water to the house via our frame mounted filtration system. The client can expect to harvest up to 224000 liters of rainwater per year reducing his dependence on municipal water, and greatly reducing his risk of being without water during periods of water restrictions. The client’s water charges will also be greatly reduced as a result. The client indicated that the system has added value to his property and will result in him getting his asking price when he decides to sell.